In typical FAA fashion, it is moving at a glacier-like pace on the use of mobile devices during flights. Acknowledging the annoyance factor, the FAA is forming a government-industry study panel and seeking public comment about the possible use of portable electronic devices — read Kindle, iPad, others — and more specifically voice over IP communications during flights. The study could potentially mean that one day soon that passenger next to you in the window seat may be loudly negotiating a business deal or gossiping with his girlfriend over Skype while you are trying to catch some sleep or are contemplating the universe. The use of cell phones for regular voice communications is not on the agenda, however. This is all part of an FAA initiative to possibly expand the use of portable electronic devices — tablets, smartphones, laptops — during all phases of flight without compromising airline navigation and communications systems. The government-industry group will study the issues over six months, and public comment is being sought over the next 60 days. 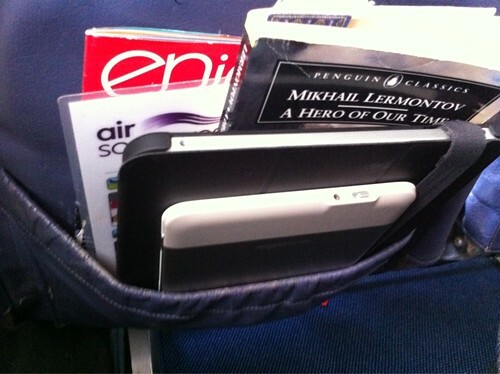 A Kindle and an iPad in a seat-back pocket. Photo by Doug Belshaw. Can you fire up that Kindle during takeoffs and landings? The public comments, review and any new FAA rules on the matter are designed to give airlines better information when they make decisions on which devices they deem kosher, and when they would be permitted to be used. The FAA says aircraft operators are permitted to demonstrate when radio frequency interference from a PED should not be considered a flight risk, and they can then authorize their use, although the vast majority prohibit powering up portable and mobile devices during takeoffs and landings. Recognizing the controversial nature of the issue, the FAA noted that it sought comments in 2005 on whether the use of cell phones during flights should be expanded. “One of the main concerns expressed by the public comment was the fear of passenger disruptions caused by cell phone use in a crowded public conveyance,” the FAA stated. The FAA is also seeking additional feedback on the technical, operational, safety and security challenges that airlines would face if they expand the onboard use of PEDs. The new Aviation Rulemaking Committee, as the panel will be called, will begin meeting this Fall and operate for six months. It will include representation from mobile companies, the aviation manufacturing industry, airlines, pilot and flight attendant groups, and passenger associations.